• After setup, all Macs on network are automatically backed up wirelessly and constantly. • USB port is so it can act as print server; no word on whether you can attach addional USB disks. • No hidden bricks: The sleek design includes a built-in power supply. • Full three-port Gigabit Ethernet router (fourth port is for WAN); 802.11n network supports up to 50 users. MACWORLD SAN FRANCISCO—January 15, 2008—Apple® today introduced Time Capsule, a backup appliance that automatically and wirelessly backs up everything on one or more Macs running Leopard™, the latest release of Apple's Mac OS® X operating system including the amazing Time Machine™ automatic backup software. Time Capsule combines an 802.11n base station with a server grade hard disk in one small package. Simply plug it in, then easily set up automatic wireless backup for every Mac® in your house to a single Time Capsule with just a few clicks. Time Capsule offers the benefits of a full-featured 802.11n Wi-Fi base station, and comes in two models: a 500 gigabyte model for just $299 and a 1 terabyte model for just $499. "Bring Time Capsule home, plug it in, click a few buttons on your Macs and voila—all the Macs in your house are being backed up automatically, every hour of every day," said Steve Jobs, Apple's CEO. "With Time Capsule and Time Machine, all your irreplaceable photos, movies and documents are automatically protected and incredibly easy to retrieve if they are ever lost." Built to work seamlessly with Time Machine, Time Capsule lets users wirelessly back up all of the data on their Macs, find lost files and even restore all of their software. In the event a file is lost, users can wirelessly search back through time to find deleted files, applications, photos and other digital media and then instantly restore the file. If it's ever necessary, Leopard can also easily restore an entire system from the Time Machine backup on Time Capsule. 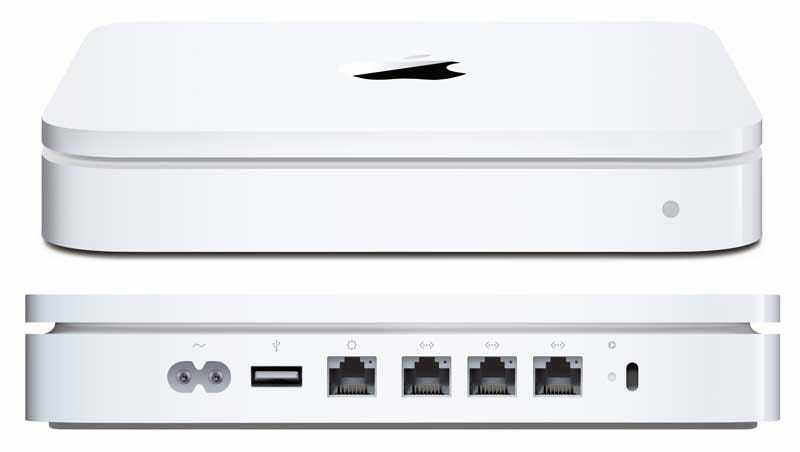 In addition to being the best way to back up a Mac, Time Capsule is also a full-featured Wi-Fi base station with the latest 802.11n technology. Delivering up to five times the performance and twice the range of 802.11g, 802.11n* is built in to Apple's iMac® desktop and the entire Mac notebook line up, including MacBook®, MacBook Pro and the new MacBook Air. Time Capsule features a sleek design with a built-in power supply and connections to print wirelessly to a USB printer. With Time Capsule, it's very easy for users to create a secure, wireless network for up to 50 users and set security restrictions such as Internet access limits for children's computers. Time Capsule will be available in February through the Apple Store® (www.apple.com), at Apple's retail stores and Apple Authorized Resellers for a suggested retail price of $299 (US) for a 500GB hard drive and $499 (US) for a 1TB hard drive.